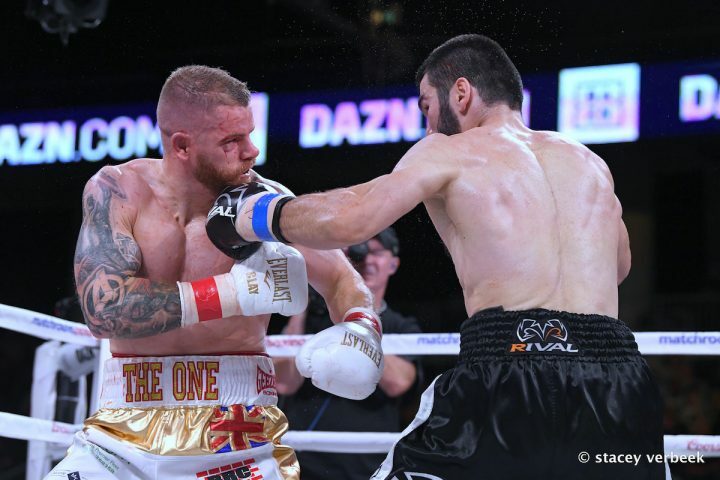 By Trevor McIntyre: IBF light heavyweight champion Artur Beterbiev (13-0, 13 KOs) dodged a bullet last Saturday night in getting knocked down by challenger Callum Johnson (17-1, 12 KOs) in the 2nd round of their fight at the Wintrust Arena in Chicago, Illinois. Beterbiev gives Johnson credit for having tried hard to beat him. Johnson forced Beterbiev to adapt by boxing from the outside. Interestingly enough, Beterbiev ended up knocking Johnson out in the 4th round after hitting him hard with consecutive right hands to the head while the two of them were in close. Johnson ran into a big right hand from Beterbiev when he had him backed up in the corner. That initial right hand from Beterbiev shook Johnson. Beterbiev then landed another right hand a split second later that dropped Johnson. The fight was stopped when Johnson couldn’t get back to his feet to resume fighting. ”I had to restart. I felt good,” Beterbiev said to IFL TV about getting knocked down by Johnson in the 2nd round. ”I respect him. He did good work. He tried his best,” Beterbiev said in giving Johnson credit for having tried hard to win. Johnson landed some crushing shots on the chin of Beterbiev in every round that would have knocked out most fighters in the 175 lb weight class. There was nothing wrong with Johnson’s power last Saturday night. Johnson was punching with authority. Where Johnson had a problem is with his accuracy. He was missing with a lot of his power shots, and that enabled Beterbiev to come back with hard counter punches. After being knocked down in round two, Beterbiev wasn’t hurt badly enough for Johnson to go after him to try and score a quick knockout unfortunately. Johnson, 33, knew that himself, and that’s why he didn’t try and shoot for a KO in the 2nd round. Beterbiev knocked Johnson down at the tail end of round one in nailing him with a right hand i close after he had become entangled in the ropes. Upon disentangling himself in the ropes, Johnson was defenseless for Beterbiev’s unexpected right hand that he tagged him with to the head. You can blame the referee for failing to step in and assist Johnson after his head gotten entangled in the ropes. The referee’s job is to step in and assist the fighter by keeping the other fighter off of them while they’re getting disentangled. In this case, the referee just stood and watched Johnson extricate himself from the ropes by himself. Beterbiev chose not to be a gentleman about it by backing off and waiting until Johnson was free from the ropes before resuming his attack. Beterbiev was in a war-like mode, so you can kind of understand why he wasn’t going to sit back and wait until Johnson was completely ready to resume fighting before he attacked him. “You see a fight not very good, but not very bad,” Beterbiev said about his win over Johnson last Saturday night. ”I win by knockout. The second round I’m down. For me, it’s experience, and I’m happy for that,” Beterbiev said. It was a good win for Beterbiev, but he showed enough vulnerability to make a lot of the top fighters in the 175 pound division to want to fight him. Johnson’s punching power really bothered Beterbiev. If Beterbiev had been fighting some of the other hard punchers in the division like Adonis Stevenson, Badou Jack and Dmitry Bivol, he might have lost. Those guys can punch as well as slug, and they have different levels to their game that we didn’t see from Callum Johnson last Saturday. ”He [Johnson] can’t do something another. You know what I mean?” Beterbiev said in explaining that Johnson had no other option but to slug with him, because he lacked the boxing skills and the height to box from the outside. ”He can only do it straight ahead. His style, he can only do it like that. I tried to do the same thing [slug] for him, but it’s not good. It’s not smart. After the second round, I changed my mind, because my coach told me, ‘Why you do the same style that he wants? Do him smart box, because you’re more height than him,’” Beterbiev said. Johnson was always going to be limited to his all-out brawling style against Beterbiev. That was the only thing that Johnson could do, and it still almost worked out well for him. After two rounds, Johnson looked like he was in great shape going into the 3rd round. A nasty cut that Johnson suffered over his right eye in round three hindered him, since he had to fight with blood dripping into his right eye constantly. Both fighters slugged it out in close in the 3rd. There were moments in which Johnson seemed to be getting the better of Beterbiev. However, the Russian fighter would then explode with a flurry of shots thrown in close range, and Johnson looked helpless during those moments. The closing moments of round three saw Beterbiev connect with a flurry of shots that had Johnson looking hurt. At the end of the round, Johnson looked like he wasn’t going to last too much longer unless he could come up with a different plan. Slugging was no longer working for Johnson, and he looked tired. It wasn’t surprising that Beterbiev knocked Johnson out in the 4th, because he was tired, bleeding and getting hit too frequently by that point in the fight for him to last any longer. Most of Johnson’s fights before facing Beterbiev had been matches that ended quickly with him scoring fast KOs against over-matched opposition. When Beterbiev failed to fold after three rounds, Johnson looked gassed out and unable to keep fighting at the same pace he’d been doing. ”Maybe now, maybe [the other top contenders and champions at light heavyweight] want to fight with me,” Beterbiev said. ”It doesn’t matter. We can do any fight. It doesn’t matter,” Beterbiev said when asked who he wants to fight next.